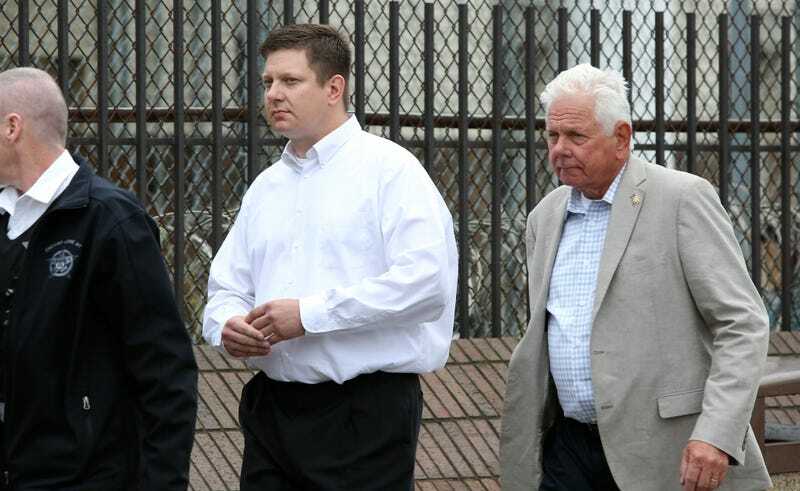 Jason Van Dyke, left, a Chicago police officer charged with murder in the 2014 shooting of black teenager Laquan McDonald, walks out of Cook County Jail in Chicago with his father, Owen, after posting bond Thursday, Sept. 6, 2018, following a court hearing where a judge ruled he won’t be jailed for giving interviews in violation of his bail terms. Van Dyke is facing murder charges for the 2014 shooting death of 17-year-old Laquan McDonald, and has been out on bond, but could’ve been sent to jail after speaking to multiple outlets last week, ABC7 Chicago reports. However, Van Dyke was able to post his $200 (or 10 percent) of the bail increase, and once again walked free following the hearing. Van Dyke sat down for his first TV and newspaper interviews, and although he declined to discuss the shooting and its aftermath, he spoke at length about the struggles he has faced since he shot McDonald 16 times, as well as the struggles he could face if convicted. “My life will never be normal again. Just from a sense of employment, I’ll never be a police officer again. I’ll … I’ll still have to live with this for the rest of my life,” Van Dyke said. “I’ve seen psychologists because of this ... I’ll never sleep normal again. I’m worried about my future, worried about my kids. Worried about their safety. “I’m petrified at the fact that I may be going to prison for the rest of my life for an act that I was trained to do by the Chicago Police Department,” he added. His interviews were brought under scrutiny on Thursday. The special prosecutor argued that Van Dyke engaged in conduct calculated to embarrass, hinder or obstruct the court in its administration of justice and that he violated the terms of his bail. Meanwhile, according to the news station, defense attorneys argued that Van Dyke did not discuss details of the case and was simply exercising his First Amendment rights. Judge Vincent Gaughan came to the decision that Van Dyke violated the second condition of his $1.5 million bail which mandated that he “obey all court orders and processes,” i.e., ignored a decorum that ordered Van Dyke and others involved in the case from speaking publicly. Community activist Frank Chapman told ABC7 Chicago that he believes Van Dyke was attempting to sway public opinion and potential jurors by giving interviews the week before jury selection for his trial began after remaining silent for so long. “He’s been trying to influence the public in his favor. There would have been no other reason for him to speak,” Chapman said.